Dr Choktsang – tibetan traditionnal doctor – wrote this book in 2002 in french for an occidental audience, as there was no dedicated book easy to find. It is an heritage of his six years studies of tibetan calligraphy in Amdo, the eastern part of Tibet. When Dr Choktsang was a student of tibetan medicine. Calligraphy was a way to complete his tuition, in a global way, rather than keeping focused on the “only” medical science. This book of a hundred pages therefore is very complete. It delivers information about calligraphy for beginners as well as those who have started to learn tibetan language or oriental / occidental calligraphy. Those people willing to develop their knowledge of tibetan will study U-Chen alphabet. Contents describe printed letters used in most printed texts ; you will also have an access to the moves of the performer and the way to handle the pen. 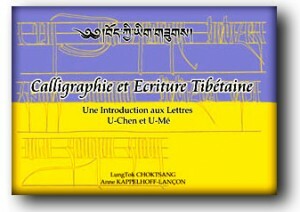 Those people who intend to use calligraphy as a leisure but do not feel like learning tibetan. They will get also an introduction to other forms of tibetan calligraphy. For example: Sug Ring et Dru Tsa, also called cursive calligraphy, are easier to adapt to artistic developments. The book is currently available in french and will be accessible at mid-october in english. It is available at the price of 15 euros for European Union. 17 dollars for USA and Canada (shipment included). You may buy the book in french (see below) or send us your email so that we send you the information when the printing is ready – please note that since the distribution will only be done through the internet. For getting the book in french, you can order online using Paypal or credit card.